Patanjali tells us that ishvara pranidhana is one of the key routes to peace of mind; to your centre; to your heart/soul/God, whatever it is that you call it. It is so important it is one of the few things that he mentions twice. Ishvara pranidhana: surrender to that which is bigger than you; feeling your connection to everyone else and to every other living thing; letting go of the idea that you can control anything at all and learning instead to meet life where you find it and how you find it; where you find yourself and how you find yourself. 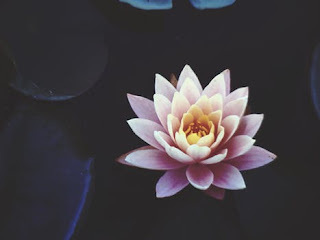 If your life is a river, then invoking ishvara pranidhana is learning to go with the flow of it: staying steady through the choppy bits, learning to allow yourself to love and enjoy the easy-flowing bits, being patient through seeming stagnation, knowing that a river never truly stops moving. It is understanding that you do not - cannot - control the way the river flows. Ishvara pranidhana is feeling yourself as an inextricable part of something much bigger than your small individual self: you are simultaneously small and insignificant in the midst of its vastness and yet an absolutely crucial, invaluable part of it. Your yoga practice is, and will continue to be, a conscious turning back to love; a deliberate move towards silence, that you might hear all that the universe, your heart and the love of God has to tell you. Ishvara pranidhana. Life unfolds. Let it. Don't push. Learn how to wait, watch and be alert; learn to trust that unfolding. There is a rightness to it that you, with all your intellect, effort and knowingness, could never have achieved. What if you don't feel in control of anything anyway?! Same applies, I suppose. V.